Before wrapping up today's Super Smash Bros. Ultimate Direct broadcast - the final one before the game launches - series director Masahiro Sakurai gave us a little taster of the game's single-player adventure mode. Entitled 'World of Light', it sees a mysterious force causing numerous video game characters to lose their bodies and transform into Spirits. A cinematic sequence showed this worrying event in action, before moving to a gameboard-style map where players move around and challenge various 'possessed' characters in battle. 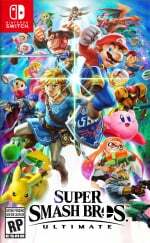 The broadcast stopped short at giving too much detail, which suggests that Sakurai wants players to discover this mode with fresh eyes when the game eventually hits store shelves. What did you make of what we were shown? Let us all know by posting a comment. It's a great compromise. Also, implementation of other series in the overworld exploration? Lapras to traverse the sea? I'm in. Anybody know who sang the theme tune tho? EDIT: I loved all the small touches like Snake in his box, inklings trying to hide in their ink, and shulk foreseeing everyone's demise. Nintendo: No! You may only develop Smash Bros! Remember when we used to think this could be a port ? All I wanted was confirmation of a single player adventure mode, and I had lost hope with only 5 minutes left, then this turned up. YEYYYY!!!!!!!!!! THANK GOD FOR THAT!!!!!!!!!! I'm so confused, is this separate from Spirits Mode? 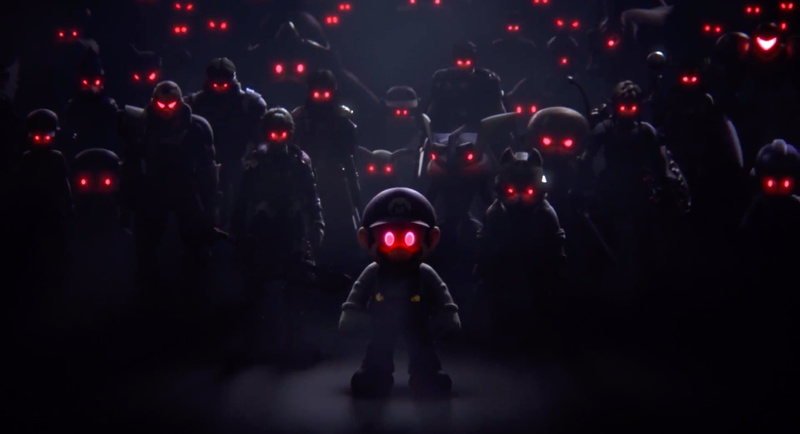 Did anyone notice any villains in the world of light trailer? Like Ridley, Ganon, Bowser, or K Rool? I'm at work now so I can't check. @Aurumonado Snake hiding in his box was just the greatest thing ever. It looks really REALLY good! It's exactly the thing I was expecting. I don't mind if it's more similar to the story mode in Brawl, or the adventure mode in Melee. Either way, I will love it. Are we just going to ignore the fact that that cutscene had VOICE ACTING?! Sure hope that's not the only one we'll see! I'm optimistic. The mode looked good. This is exactly the sort of addition I was hoping for. This was the announcement I was waiting for. A cinematic story mode that ties all the characters (and spirits!) together with a gorgeous world map, epic fanservice-y bosses, and frickin' VOICE ACTING?!? Sakurai, I may disagree with some of your character choices for this Direct, but you knocked it out of the park with this game overall. I hope there are a lot of cutscenes in them. Loved how most characters had voice acting, sounded really neat. Hopefully playable in co op too, just like Subspace. The only thing I didn't like is that they announced a Singleplayer mode two months before launch, such a weird decision. It definitely looks nice, though I hope it’s not only battles but a bit more varied like Melee’s Adventure was. I’d also like it to have some side-scrolling levels à la Subspace Emissary, as I loved that and have always thought it could make for a great SSB spin-off. This is just a deluxe classic mode. Change my mind. I am super excited for smash and ''world of light'' is the cherry on the cake! The evidence is already there to disprove your theory, so I don't think a debate will change your mind. This is so AWESOME. I don't know if I should get the physical or the digital version, any thoughts? My Switch library is a mixture of physical and digital games. I'm going digital with Smash since this is going to be one of my most played Switch games alongside Pokemon and Animal Crossing, and I'm always going to want easy access to Smash for online and local multiplayer. It's up to you though, games always look nice on your shelf. So, we didn't see much, but am I right in assessing this as kind of an RPG overworld....with RPG skill trees? As a Smash single player mode? If so, that looks completely awesome! Yeah, that's what it seemed like. It looks like you traverse the map, get into battles with all of these crazy modifiers and use your spirits, level them up, unlock new ones, learn skills, etc. There looks to be puzzles on the world map and different things going on in each section, and you can see the big bosses like Rathalos flying around. Oh, and cutscenes. It's looking excellent, and far more than I'd expect a fighting game to have for a singleplayer mode. @Aurumonado "Everyone dies. Except Kirby." @Frenean That really seems awesome. To be fair, fighters have been getting more sophisticated with campaigns which is wonderful. Killer Instinct has a Rogue-like metagame. DB:FZ has a sort of branching path stage based system. Soul Calibur VI has a cool replayable "build your own campaign and acquire new weapons with a create-a-character." to become any "class". Fighters have become a really cool thing. But this is a neat direction for Smash to take with RPG-ifying it. I haven't seen a fighter really do that yet. Heh, am I the only one that got a very Planet Meteos vibe from the big bad? @Frenean well sadly it can't participate in GOTY since it comes out on December 7. It will be eligible for 2019 which isn't that bad since I don't want it competing with Red Dead Redemption 2 lol. I'm still a little confused, but that map at the end pretty much saved the ND for me. The cut scene was ok but I was distracted by what Sakurai said just before that. I know he said "Subspace Emissary' but I wasn't sure if he said it in a good way or a bad way. But we got a map. And a name. World of Light gives those interested something to talk about. All the rest of the Spirits stuff looks like some insane micro-level management mobile game to me, they must have been drooling in Japan, but it made me remember we did use stickers to improve our characters in Subspace Emissary, so as overly complicated as it sounds maybe it's just really an improvement on that. @Frenean Yeah, I mean some just have "story" modes that are just huge half hour cutscenes between fights in "special" maps. Injustice and MK probably did the best "story-driven adventure" in a fighter. But these new ones, apparently including Smash, are getting pretty fancy with actual metagames so you're actually playing a game that includes fighting as a battle system. It's cool to watch fighters turn into actual video games instead of pick-up-and-play arcade sessions SCVI was going to be my top pick (and still is...joysticks matter ), but Smash may actually close in. I do still love DoA and Tekken though. My mains the sole survivor! Heck yeah!! This will be the first Smash I've played, been excited since it was announced and now Dec just can't come quick enough for me. @Aurumonado be careful what you wish for. Looked really cool to me. @NEStalgia Flying Dragon (N64) was amazing. Yes this is the Adventure Mode I was pondering about, heck it doesn't even need cutscenes to enjoy it too. Everyone is here? More like Everyone is dead. @thesewoodenideas Just wanted say props on your image and username. One of my favorite bands ever! I did manage to catch this part of the broadcast; color me curious! Always been a huge fighting game fan (mostly 2D Capcom/SNK types) but never been into online multiplayer and these days have no one to play against locally. Really enjoyed the recent Mortal Kombat/Injustice games for the single player campaign, so a good single player will definitely get me to pick this one up. Edit: That said it's currently the same price as Red Dead Redemption 2 and I'm guessing it won't have that much single player content, so maybe I'll have to pray for a sale. "I told you, I'm through with it! I don't want to run around in that piece of scrap metal anymore!" "But you're the only one who can save us now, Bren!" Bren slips into his Turrican Assault Suit. Ok. Now I'll buy it. @MrJuancho Depends on how much room you have on your SD card and the file size. And if you have friends that want to borrow it. @Strumpan The only close friend whom I might lend it to, lives in another city and is buying his own game so we can play online. I do have a 128 Gb MicroSD. I have only played 2 digital games, and that's because they were cheap, having your game in your hand is a great feeling, but buying it digital means fewer catridges to travel with. I am not planning to sell the game in any point after having bought it either. Ironically physical versions are cheaper than digital, in my country. So I don't know what to choose. This really is the greatest Smash Bros game ever. This looks wonderfully kitsch and over-the-top! @Aurumonado I noticed Bowser shooting fire alongside Charizard. If I'm not mistaken this is just a new version of event mode. You can't even argue against this now. It's a friggin' fact. It's a thing, I will play it. So hyped for this mode! The reveal cutscene was both epic and hilarious! I hope there are actual stages. @BladedKnight i know! I couldn't help but think, "uh oh! Looks like thanos snapped and everyone died but kirby!" Looks as epic though! @Sinton: Which is why I found it amusing. Thanos: I will wipe out half of the marvel universe. @jpfan1989 Yeah it had a bit of an infinity war feeling. Bowser was among the team of fighters. Maybe this takes place after S.S.E. but, considering this is dealing with spirits rather than trophies, probably not. After this reveal of the Adventure mode, the scene from Spongebob where Squidward tastes a Krabby Patty the first time and worships it came to my mind. There might be more cutscenes, but the "leave the rest to your imagination" quote is leaving me doubtful. Still, they've completely sold me on this. At last, an adventure mode! @Aurumonado I promise you man..... When they showed Inklings and Snake..... I laughed so hard!!!!! @needmorecowbell cheers. Always good to meet another fan especially a Nintendo one also! Wow, I hadn't seen this video yet, but it looks great! That mode alone is an incentive to get Smash.